A well thought-out configuration in your data center requires a set of racks, cooling systems and other accessories. All your mountable networking equipment, your wiring and other devices will be ideally ordered. 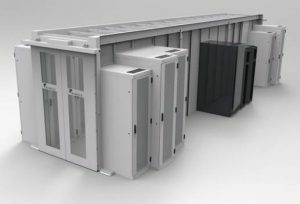 To meet all your specific needs, Minkels, a part of the Legrand group, supplies modular solution ranges for data centers and server rooms. In its greatly broad portfolio, you will find the best suitable data center rack for all your projects, however large or modest they may be. Besides, the strengths of these products lie in their flexibility and innovation. As a customer, you can always be certain of using the world&apos;s most modern data center technologies! So, do not hesitate to ask A.N.S. for more information regarding the types of server racks or anything else. The Varicon range of housing solutions consists of racks of all sizes, widths and depths. They are perfectly suited for your cabling, servers, network switches and other network products. Furthermore, the co-location cabinets are ideal for dividing the space securely between a few clients. Your data center&apos;s energy bill can rise quickly if your server rack cooling system is not suitable. The volume of your data center and the density of your racks have a crucial impact on the choice of the right equipment. Therefore, the economical Varicondition solutions consist of air and water-based systems that are suitable for all situations. For example, the Cold Corridor divides cold from hot air, in particular in large spaces. You can often receive all standard products within 24 hours like a 42u server rack or some rack mount accessories. However, you can custom each aspect from hundreds of options.